Callaway is part of a new-look receiving corps led by Odell Beckham and Jarvis Landry, Dan Labbe of The Cleveland Plain Dealer reports. Callaway had the marijuana-related charge from last August dismissed this offseason as part of a plea agreement, Nate Ulrich of the Akron Beacon Journal reports. Analysis: Callaway could still be disciplined by the NFL under the league's policy on substances of abuse. The 22-year-old has a long history of off-field issues dating back to his time at the University of Florida, and he started his pro career in the substance abuse program after turning in a diluted sample at the 2018 NFL Scouting Combine. Callaway hauled in four of his seven targets for 79 yards and a touchdown in Sunday's 26-24 loss to the Ravens. Callaway was unable to haul in his lone target during Sunday's 26-18 win over the Bengals. Analysis: It was the rookie's first catchless outing since Week 1, this after he tied a season high with five catches in Week 15. It's probably best not to read too much into just one game, particularly as he's built a nice role for himself on a surging Browns squad. Cleveland's now out of playoff contention, but they can play spoiler next Sunday against a Ravens squad that gave up just three catches for 22 yards to Callaway in Week 5. Callaway hauled in five of seven targets for 35 yards and a touchdown in Saturday's 17-16 win over the Broncos. 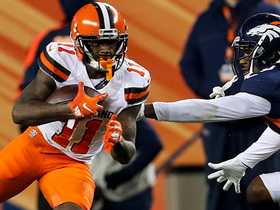 Analysis: Callaway's five receptions led the Browns, one of which went for a two-yard touchdown, giving the rookie wideout four touchdowns on the year. His production has been a bit sporadic throughout the season, but that's to be expected from a rookie. Next week's matchup against the Bengals shiuld be a favorable one for Callaway, as he looks to string a few strong performances together to finish out his debut season. Callaway caught his only target for no gain during Sunday's 26-20 win over the Panthers. 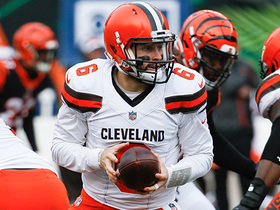 Analysis: Baker Mayfield only attempted 22 passes, making it hard for Callaway to get involved on offense, as he failed to build on his career-high performance in Week 13. The rookie wideout has reeled in seven passes for 146 yards over the past two games before Sunday, and has become Mayfield's favorite deep threat. Callaway will look to get back on track Saturday against the Broncos. 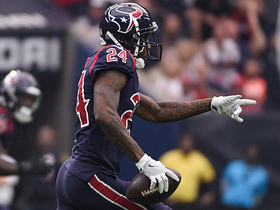 Callaway caught three of six passes for 84 yards and lost a fumble in Sunday's 29-13 loss to the Texans. Analysis: Callaway had a 76-yard touchdown called back on on offensive holding penalty in the third quarter. He caught a 71-yard pass two plays later, but he fumbled at the 6-yard line at the end of the play. 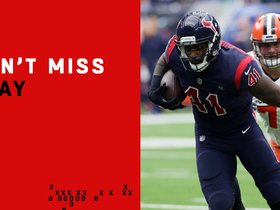 The speedy rookie has displayed his big-play ability by averaging a robust 19.7 yards per catch on his 12 receptions over the past four weeks, so owners in deeper formats should have him on their radars ahead of a Week 14 tilt against Carolina. Callaway hauled in four of five targets for 62 yards and a touchdown in Sunday's 35-20 win over the Bengals. Analysis: Callaway scored the second of four unanswered Cleveland touchdowns to open the game. That 13-yard score was Callaway's third of the season, and his 62 receiving yards were just shy of David Njoku's team-leading total of 63. The rookie receiver will look to build on this performance against the Texans in Week 13. Callaway caught both of his targets for 39 yards in Sunday's 28-16 win over Atlanta. 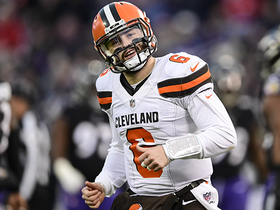 Analysis: Callaway led the Browns in receiving yards, as quarterback Baker Mayfield spread the ball around. The rookie wide receiver has 26 catches for 326 yards and two touchdowns heading into the Week 11 bye. Callaway caught three of five targets for 51 yards during Sunday's 37-21 loss to the Chiefs. Callaway (ankle) is listed as active for Sunday's game against the Chiefs. Analysis: Callaway, who injured his ankle in practice Thursday, will give it a go Sunday, but even if his ankle isn't much of an issue Sunday, his Week 9 fantasy upside could be hampered by the return to action of Rashard Higgins (knee). Callaway will first test out his injured ankle in a pre-game workout before a decision on his status for Sunday's contest against the Chiefs is made, but the Browns believe he'll be able to play, Ian Rapoport of NFL Network reports. Callaway (ankle) is listed as questionable for Sunday's game against the Chiefs, Scott Petrak of the Elyria Chronicle-Telegram reports. Analysis: Fellow wideout Rashard Higgins (knee) is also listed as questionable, but he seems to be trending toward an active status after practicing Thursday and Friday. Meanwhile, Callaway, who injured his ankle at Thursday's session, according to Petrak, didn't practice in any capacity Friday and looks more uncertain for Week 9. In the event Callaway sits out Sunday, Higgins -- if active -- would likely move into the starting lineup opposite Jarvis Landry. Callaway (ankle) didn't take part in Friday's practice, Scott Petrak of the Elyria Chronicle-Telegram reports. Analysis: Callaway's name popped up on the injury report Thursday because of the ankle issue, and his absence Friday indicates he may be dealing with more than just a simple sprain. It also leaves his status for the Week 9 matchup with Kansas City firmly in question. More will be known about Callaway's availability when the Browns release their final injury report of the week after Friday's practice wraps up. Callaway was added to the Browns' injury report Thursday after being limited by an ankle injury. Analysis: While Callaway was added to the report, fellow wideout Rashard Higgins (knee) returned to a limited practice Thursday. Meanwhile, Jarvis Landry and Damion Ratley are the team's top healthy options at the position as Sunday's game against the Chiefs approaches. Added clarity on the likely pecking order behind Landry should arrive upon the release of Friday's final injury report. Callaway caught five of six targets for 36 yards and a touchdown during Sunday's 33-18 loss in Pittsburgh. Analysis: Callaway brought Cleveland to within a score in the third quarter, running under a Baker Mayfield loft for a 1-yard touchdown -- his first since Week 2. Callaway is clearly the third option, and second receiver, in the Browns' offense behind Jarvis Landry and David Njoku, but at under 30 yards per game, he's not fantasy-relevant week-to-week. Next Sunday might be an exception given a favorable matchup against a weak Chiefs pass defense. Callaway hauled in one of two targets for 14 yards during Sunday's 26-23 overtime loss to Tampa Bay. Callaway managed to bring in two passes on 10 targets for nine yards during Sunday's 38-14 loss to the Chargers. Analysis: The rookie wideout has struggled with drops during his short time in the NFL, and Sunday's game was no different, highlighted by the fact he caught just 20 percent of his targets. Callaway continues to garner strong target numbers from Baker Mayfield, but until he consistently able to haul them in, his fantasy value in the majority of formats is low. 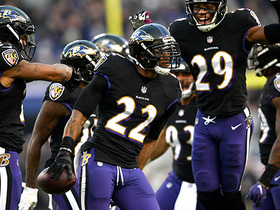 Callaway corralled three of five targets for 22 yards in Sunday's 12-9 overtime win against the Ravens. Analysis: Though Callaway played 24 more offensive snaps than fellow wideout Rashard Higgins (knee), it was Higgins who had the better performance, racking up more yards and catching a touchdown. The rookie's five targets were his lowest total since Week 3, and it still doesn't seem like Callaway and Baker Mayfield are on the same page. If this trend continues, Higgins could move up on the depth chart and supplant Callaway as Cleveland's No. 2 receiver when he returns from his MCL sprain. Callaway (knee) practiced fully Friday and will play Sunday against the Ravens, Mary Kay Cabot of The Cleveland Plain Dealer reports. Analysis: The same applies to Jarvis Landry (knee), meaning that the Browns will have both of their top two wideouts available this weekend. Per the report, coach Hue Jackson would like to see Callaway start faster this week, noting that the Browns will make every effort to get the rookie pass catcher on track out of the gate. Over his last two games, Callaway has logged 19 targets, but that volume yielded a modest total of seven catches for 74 yards. Callaway (knee) took part in the portion of Friday's practice open to the media, Tom Pelissero of NFL.com reports. Callaway (knee) logged a limited practice session Thursday. Analysis: That's an upgrade from his Wednesday practice absence, which represents the same pattern followed by fellow receiver Jarvis Landry. We'll circle back on Callaway's status Friday, but he's headed in the right direction as Sunday's game against the Ravens approaches. Callaway (knee) was on the field for the start of the Browns' practice Thursday, Mary Kay Cabot of The Cleveland Plain Dealer reports. Coach Hue Jackson said he has "a great level of optimism" Callaway (knee) will be able to play Week 5 against Baltimore, Nate Ulrich of the Akron Beacon Journal reports. Analysis: Callaway was held out of Wednesday's practice after playing through his knee injury during the overtime period of Sunday's 45-42 loss to the Raiders. Jackson is hopeful both Callaway and Jarvis Landry (knee) will avoid missing time, but both players will need to be monitored throughout the week. Rashard Higgins will be the top candidate for an expanded role if either Callaway or Landry is unable to play. Callaway was held out of Wednesday's practice due to a knee injury, Nate Ulrich of the Akron Beacon Journal reports. Analysis: Callaway was injured on a 59-yard gain in the fourth quarter of Sunday's 45-42 loss to Oakland, but he was able to return and gut it out through overtime. His absence from practice creates some question about his status for Week 5 against Baltimore, potentially freeing up Rashard Higgins for an expanded role in the Cleveland passing game. Top wideout Jarvis Landry also missed Wednesday's practice with a knee injury. Callaway (undisclosed) isn't practicing Wednesday, Nate Ulrich of the Akron Beacon Journal reports. Per Mary Kay Cabot of The Cleveland Plain Dealer, Callaway rode a stationary bike off to the side during Wednesday's practice. Analysis: Callaway was slow to get up after breaking off a 59-yard gain in the fourth quarter of Sunday's 45-42 loss to Oakland, but he returned to the game in short order and took snaps during the overtime period. The rookie finished with three catches for 54 yards on nine targets, after managing just four catches for 20 yards on 10 chances the previous week. Rashard Higgins likely would step up as the No. 2 wide receiver if Callaway were to miss Week 5 against the Ravens. Callaway caught three of nine targets for 54 yards during Sunday's 45-42 loss to the Raiders. Analysis: Callaway played 70 percent of the Browns' offensive snaps and finished second on the team in targets, but his 33 percent catch rate leaves a lot to be desired. Still, the rookie wideout seems to already be one of Baker Mayfield's favorite targets, and that could ultimately pay big dividends down the line if the two start completing passes on a more consistent basis. Callaway has seven receptions on 19 targets over the past two weeks. Callaway pled not guilty last week to two misdemeanor charges from a traffic stop in August, Tom Pelissero of NFL.com reports. Callaway brought in four of 10 targets for 20 yards in the Browns' 21-17 win over the Jets on Thursday. The Browns will need to lean more on Callaway if Jarvis Landry (knee) doesn't play in Thursday's game against the Jets, Patrick Maks of the Browns' official website reports. Callaway caught three of four targets for 81 yards and a touchdown during Sunday's 21-18 loss to the Saints. He also carried the ball twice for seven yards. Callaway will replace Josh Gordon in the starting lineup Sunday against the Saints, Pat McManamon of ESPN.com reports. Callaway was on the field for just 15 of Cleveland's 89 offensive snaps and drew just one target during Sunday's 21-21 tie with the Steelers. Analysis: The rookie wideout -- who was originally listed ahead of Josh Gordon and Rashard Higgins on the depth chart -- was the clear No. 4 receiver Week 1. Gordon logged 69 snaps and Higgins played 54 to Callaway's 15. While Callaway has higher upside than Higgins due to the big-play ability he showed in college, it doesn't look like he'll be given many opportunities to showcase his talents any time soon. Callaway will start the season as the Browns' primary punt returner, Scott Petrak of the Elyria Chronicle-Telegram reports. Analysis: Callaway is also set to start at wide receiver against the Steelers with Josh Gordon (hamstring) facing a limited snap count. Realistically, the rookie fourth-round pick should slot in as the team's third wideout once Gordon is fully cleared, with Jarvis Landry likely to see a high volume of targets. Jabrill Peppers could also see some action on punt returns and will also start as the team's primary option for kick returns. Coach Hue Jackson relayed that Callaway is on track to start against the Steelers on Sunday even if Josh Gordon (hamstring) is available, as expected, Nate Ulrich of the Akron Beacon Journal reports. Analysis: This nugget gives Callaway a degree of streaming appeal Week 1, but with target-gobbling Jarvis Landry on hand and Gordon still likely to factor in some Sunday, Callaway's fantasy upside in the contest is tough to peg, as the Browns open up their 2018 season with Tyrod Taylor at QB. Callaway was held without a catch on one target in Thursday's preseason finale against the Lions. Callaway (groin) will play in Thursday's preseason game against the Lions, Andrew Gribble of the Browns' official site reports. Callaway (groin) was back at practice Saturday, Mary Kat Cabot of Cleveland.com reports. Analysis: Callaway injured his groin late last week, causing him to miss Cleveland's third preseason game against the Eagles. The rookie's presence at practice does not mean he is fully recovered from his injury, but it is a positive sign of recovery with only 15 days remaining until the Browns' regular-season opener. Callaway has shown flashes in the preseason, but there are still questions about his off-field behavior, highlighted by a citation for marijuana possession in early August. Callaway (groin) is expected back at practice soon, Scott Petrak of the Elyria Chronicle-Telegram reports. Callaway (groin) won't play in Thursday's preseason game against the Eagles, the Cleveland Plain-Dealer reports. Analysis: Callaway has missed the last three days of practice with his groin injury, which sets the stage for starting QB Tyrod Taylor to be without two of his top three wide receivers Thursday. Jarvis Landry is slated to be on hand for the contest, but Josh Gordon remains on the Browns' active/NFI list. Callaway (groin) sat out team drills Tuesday and is in jeopardy of missing Thursday's preseason game against the Eagles, Mary Kay Cabot of The Cleveland Plain Dealer reports. Analysis: Callaway hasn't practiced since last Friday's preseason game against the Bills, leaving his availability for Thursday's contest up in the air. However, his groin injury is considered minor, and the rookie wide receiver should be ready to go in Week 1, if not for the team's preseason finale. Callaway (groin) is missing team drills again Monday, Mary Kay Cabot of The Cleveland Plain Dealer reports. Analysis: Callaway hasn't been able to practice since he was held without a target in Friday's preseason loss to the Bills. He still seems to have the inside track to the No. 3 receiver job, but Rashard Higgins is also in the mix. It's a far less interesting battle now that Josh Gordon has rejoined the Browns with eyes on a Week 1 appearance. Callaway did not participate in team drills during Sunday's practice due to a tight groin muscle, Scott Petrak of The Chronicle-Telegram reports. Analysis: Callaway was limited by the minor groin injury Sunday, but the issue isn't slated to keep him sidelined for much longer. During his absence, Damion Ratley took reps with the first-team offense alongside Jarvis Landry and Rashard Higgins. Callaway has until Thursday to recover before the Browns host Philadelphia in Week 3 of the preseason. Callaway didn't draw any targets in Friday's preseason game against Buffalo, but he did take one carry for three yards and one punt return for nine yards. Callaway was limited in practice Sunday due to sore ribs, Nate Ulrich of the Akron Beacon Journal reports. Callaway led the team in receiving with three receptions on seven targets for 87 yards and a touchdown during Thursday's 20-10 preseason win against the Giants. Analysis: Callaway entered the preseason opener with recent off-field baggage, but the rookie wideout didn't let that affect him. He showed his big-play ability by catching a short slant pass from Baker Mayfield that he took 54 yards to the house for a touchdown. If he continues to impress, he should have no problem overtaking Rashard Higgins as the team's No. 3 receiver. Callaway will suit up for Thursday's preseason game versus the Giants, Mary Kay Cabot of The Cleveland Plain Dealer reports. Callaway, who was cited for marijuana possession over the weekend, is traveling to New Jersey with his teammates ahead of Thursday's preseason game against the Giants, Scott Petrak of the Elyria Chronicle-Telegram reports. Callaway was cited Sunday for marijuana possession and driving with a suspended license, Mary Kay Cabot of The Cleveland Plain Dealer reports. Callaway received first-team reps during Monday's practice, Mary Kay Cabot of The Cleveland Plain Dealer reports. 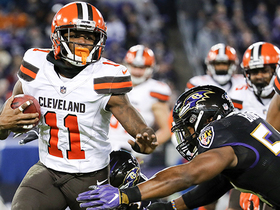 Analysis: A day after the Browns jettisoned Corey Coleman to Buffalo, Callaway replaced him on the first-team offense, lining up alongside Jarvis Landry. Callaway's time as a starter is likely to be short-lived as the team awaits the return of Josh Gordon (personal), though when and if that happens, the rookie figures to have a leg up on Rashard Higgins for the No. 3 wideout spot, due to his strong start to training camp. 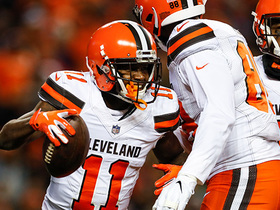 Callaway's emergence and potential as an "X" receiver made Corey Coleman expendable to the Browns, Mary Kay Cabot of WKYC-TV reports. Callaway (groin) practiced Thursday, Nate Ulrich of the Akron Beacon Journal reports. Analysis: As expected, Callaway was on the field Thursday, having fully recovered from the groin injury he suffered during OTAs this spring. The rookie wideout should see some extra work while Josh Gordon is away from the team, though Corey Coleman is still ahead of him on the depth chart. Callaway (groin) has been cleared for the start of training camp, Andrew Gribble of the Browns' official site reports. 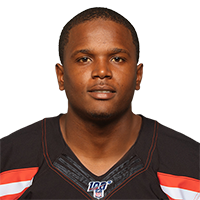 Callaway (groin) will not participate in minicamp this week, Andrew Gribble of the Browns' official site reports. Baltimore Ravens cornerback Jimmy Smith intercepts forced pass by Baker Mayfield. Cleveland Browns quarterback Baker Mayfield hits wide receiver Antonio Callaway for a touchdown. Cleveland Browns wide receiver Antonio Callaway reaches out to grab laser pass from quarterback Baker Mayfield. Houston Texans linebacker Zach Cunningham races for TD after picking off Cleveland Browns rookie quarterback Baker Mayfield. Houston Texans defensive back Justin Reid forces Antonio Callaway fumble on what would have been 77-yard touchdown. 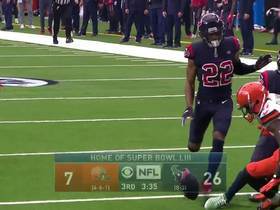 Houston Texans cornerback Johnathan Joseph baits Cleveland Browns rookie quarterback Baker Mayfield into another Houston Texans' interception. 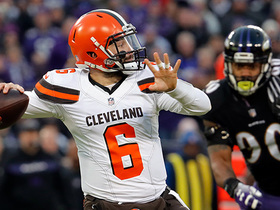 Cleveland Browns quarterback Baker Mayfield finds wide receiver Antonio Callaway near sideline for a 21-yard completion.